This is Samir with his beloved grandmother. Samir was only 10 years old when the black-clad men arrived with their guns and their insults. He’d heard of them. He’d seen their flags and heard rumors of what they were doing to people. The large family’s tiny old car meant everyone couldn’t escape in one trip, and Samir’s father had to make a hard choice. He asked if anyone would stay behind. 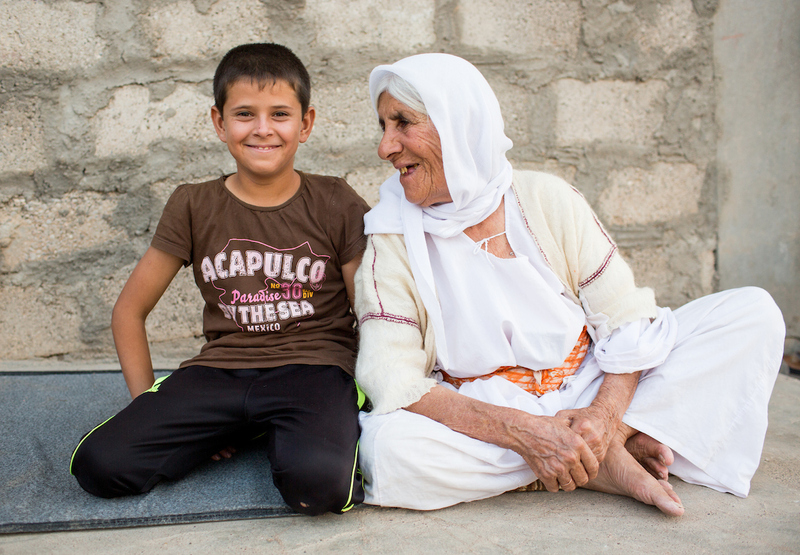 Grandma wasn’t ready to travel, so Samir volunteered to stay back to watch over her. This big-hearted, 10-year-old man, he was sure dad would be back to pick them up within hours. A whole day passed. With the sound of gunfire getting closer, Samir decided to walk with grandma. It was slow going, and they had to stop to rest often. Grandma was seated near a grove of trees when Samir saw the trucks coming toward them. They tried to hide, but it was too late—they’d been spotted. The ISIS fighters walked right up to grandma and began bullying her, asking her questions, picking, poking, prodding. Nobody treated Samir’s grandma this way. Samir strode up to the militants, put himself between them and her, and shouted back at them defiantly. In response, they lurched forward, grabbing Samir and pinning him to the ground. Another went for a can of gasoline. Samir struggled, smelling the gas as it spilled out, soaking his pants. He kicked and flailed even harder. The *chik* sound of a lighter. Then, with Samir’s grandmother watching in horror, the lighter fell, igniting Samir’s little body. The despair in this father’s eyes was one of the most heartbreaking things I have ever seen. I did not ask Samir about being burned, only to share what he was comfortable sharing from before or after. The trauma this family has experienced is unimaginable, and the last thing I wanted to do was to make it worse. Later, his father shared the more painful details of his son’s story so Samir wouldn’t have to. The pickup truck lurched down the road. Samir felt every bump. His entire right side, from his hip down to his toes, was charred. In some places, his pants had melted into his skin. The ISIS fighter driving the truck threw the truck into park and got out. Samir recognized the little town—it was on the way to ISIS’s stronghold of Mosul. “Come to the shower and we’ll wash you,” a militant told Samir. ISIS held Samir and his grandmother captive for several weeks before inexplicably freeing them. Some people speculated that it was a secret prisoner exchange, while others thought it was just an uncharacteristic act of kindness—Samir still doesn’t know why he and his grandmother were released. The family was reunited and relocated to the Zawita camp in northern Iraq, where we met them. The family’s joy at being reunited and together again was short-lived when his parents heard the story of what happened to their little boy, when they saw his burns. His parents immediately began asking around about surgical care, taking him to clinics and hospitals in the area. For a family like Samir’s, this was a costly process, but Samir’s father is a bulldog, unrelenting and focused on getting his son the care he needs. Samir looked down and gave a shy smile—it was the first we’d seen on his face. For his family, some aspects of life have become “normal” again. They have chores. They share meals together. They talk about the war and when they can go home. But Samir’s leg is a painful reminder of what happened—and the fact that, while life goes on, it will never be the same. We promised Samir’s dad we’d do more than just get a good story. We promised we’d come back—and keep coming back—as long as it takes to help Samir’s family and the whole community get back on their feet. We came back to listen—because Samir’s family and the other members of this community know best what they need, not us. We came back with chickens to give them a more sustainable source of food. We came back with regular deliveries of clean, safe drinking water. And we will keep coming back—because Samir deserves more than our admiration and praise. He deserves a chance at a normal life. He deserves to be happy, whole, and safe. He deserves a chance to walk normally to school, to play soccer with his friends, and to be back on his feet, standing tall and caring his family. We are determined to see this boy heal. Recently, we connected Samir’s family to a highly acclaimed orthopedic surgeon, who has offered to help Samir get the operation he needs for his leg to function again. There are many, many hurdles ahead, but we won’t stop. Because when you look at Samir, you see more than a boy who was traumatized by ISIS. You see a boy who defied hate, who stood up for his grandmother, who deserves to be just a boy again. You see beyond the trauma. And slowly, your love is helping Samir see beyond trauma, too. See beyond trauma in Iraq and Syria. Give now, and help families rebuild after ISIS.